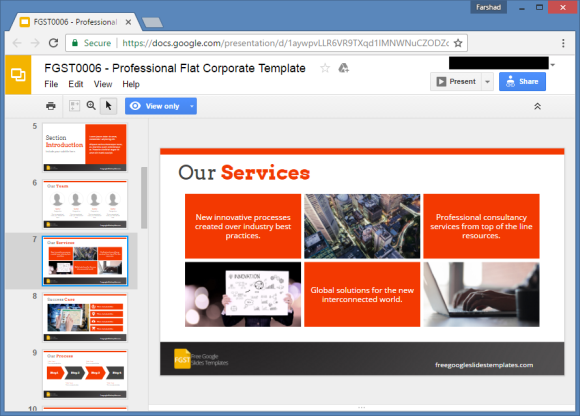 There are a few very handy third-party Google Slides Templates that can be used for making formal presentations, and one of them is the Free Corporate Presentation Google Slides Template. 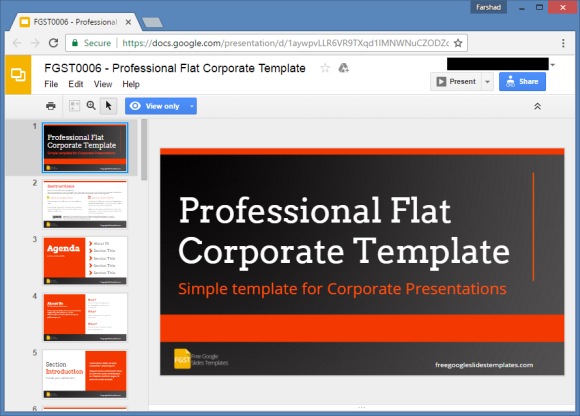 With nearly 2 dozen sample slides, this template gives a number of layouts that can be used for making corporate presentations. These presentations can be created with charts, diagrams and infographics, comparisons, and other slide types by making use of the sample content in this template. 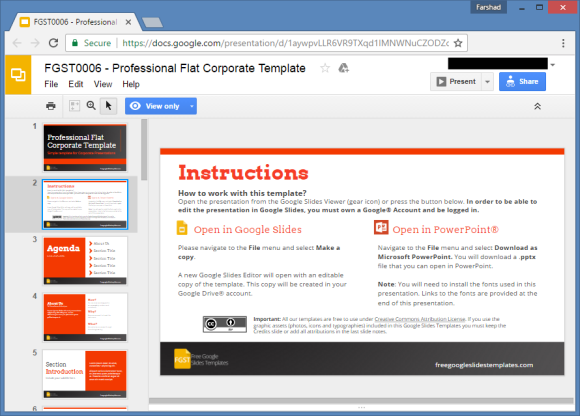 The second slide gives instructions for using the template. 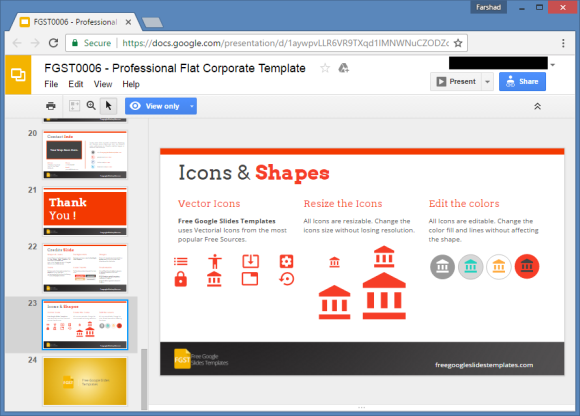 Once the template is launched in Google Slides, it will be in View Only format. To use the template, go to the File menu and select Make a copy. With shades of orange on a white background, the template design makes it legible on all kinds of big and small screens. You can also change slide colors to use your own color schemes to redesign the slides. There are different sample slides for designing your content, where you can not only make text-heavy slides but also introduce your team, add data charts, create diagrams using sample diagrams in sample slides, as well as replace sample images with your own to design your slides. 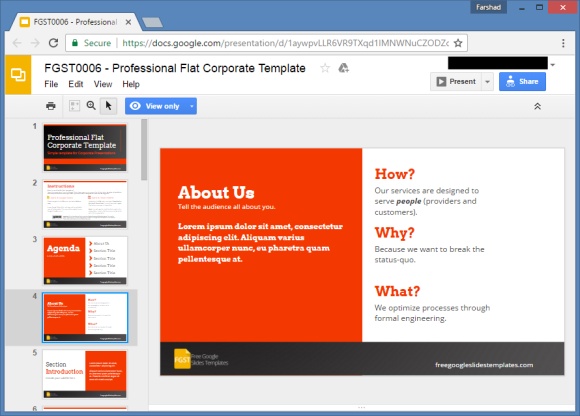 This template also provides slides suitable for making timelines and roadmaps. You can use the editable timelines by adding your text or extending or reducing the given duration in the sample timeline slide. There is also a clipart slide which gives useful corporate clipart that you can copy to design your slides. 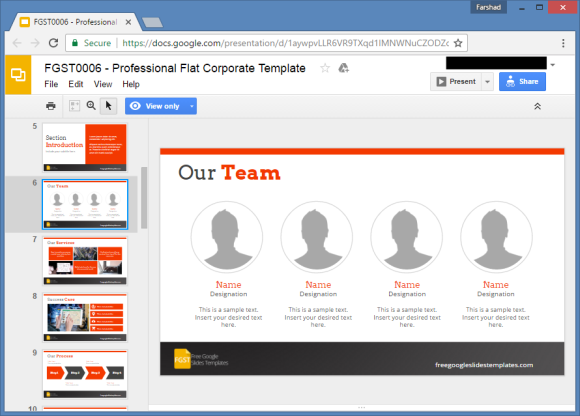 You can either download the template offline in PowerPoint format or open and make a copy of it right from within Google Slides. To download this free template, see the link below.